Rabbit recombinant monoclonal C Reactive Protein antibody [Y284]. 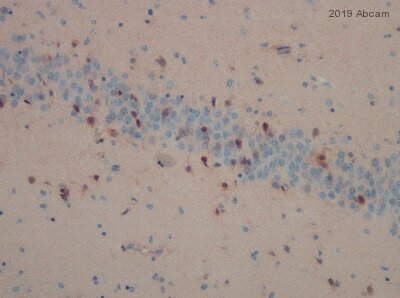 Validated in WB, IP, IHC and tested in Human. Cited in 20 publication(s). ab32412 recognises C Reactive Protein. This antibody is predicted to detect the splice isoform 2. Synthetic peptide within Human C Reactive Protein aa 200 to the C-terminus (C terminal). The exact sequence is proprietary. ab32412 reacts with an epitope located in the C terminal region of C Reactive Protein. WB: Human serum and plasma lysates. IHC-P: Normal human liver tissue. IP: HepG2 whole cell lysate. Our Abpromise guarantee covers the use of ab32412 in the following tested applications. WB 1/1000 - 1/2000. Predicted molecular weight: 25 kDa.Can be blocked with C Reactive Protein peptide (ab216758). Immunohistochemistry (Formalin/PFA-fixed paraffin-embedded sections) analysis of human liver tissue labelling C Reactive Protein with purified ab32412 at 1/100. Heat mediated antigen retrieval was performed using Tris/EDTA buffer pH 9. ab97051, a HRP-conjugated goat anti-rabbit IgG (H+L) was used as the secondary antibody (1/500). Negative control using PBS instead of primary antibody. Counterstained with hematoxylin. Immunohistochemistry (Formalin/PFA-fixed paraffin-embedded sections) analysis of human skeletal muscle tissue labelling C Reactive Protein with purified ab32412 at 1/100. Heat mediated antigen retrieval was performed using Tris/EDTA buffer pH 9. ab97051, a HRP-conjugated goat anti-rabbit IgG (H+L) was used as the secondary antibody (1/500). Negative control using PBS instead of primary antibody. Counterstained with hematoxylin. ab32412 (purified) at 1/30 immunoprecipitating C Reactive Protein in HepG2 (human liver hepatocellular carcinoma cell line) whole cell lysate. Lane 2 (+): ab32412 + HepG2 whole cell lysate. Lane 3 (-): Rabbit monoclonal IgG (ab172730) instead of ab32412 in HepG2 whole cell lysate. Immunohistochemistry (Formalin/PFA-fixed paraffin-embedded) analysis of human normal liver tissue labelling C Reactive Protein using unpurified ab32412 at a dilution of 1/100. Publishing research using ab32412? Please let us know so that we can cite the reference in this datasheet.